Red Hood and the Outlaws is a series that has been flying under the radar since the beginning of Rebirth, even though its one of the more consistently entertaining books. Brought to us by writer Scott Lobdell, The Outlaws has been a book that has excelled in deepening the relationship between main leads with each adventure informing their connections. Red Hood and the Outlaws #19 is filler issue, but it sets up the characters for the next story in an entertaining and intriguing way. 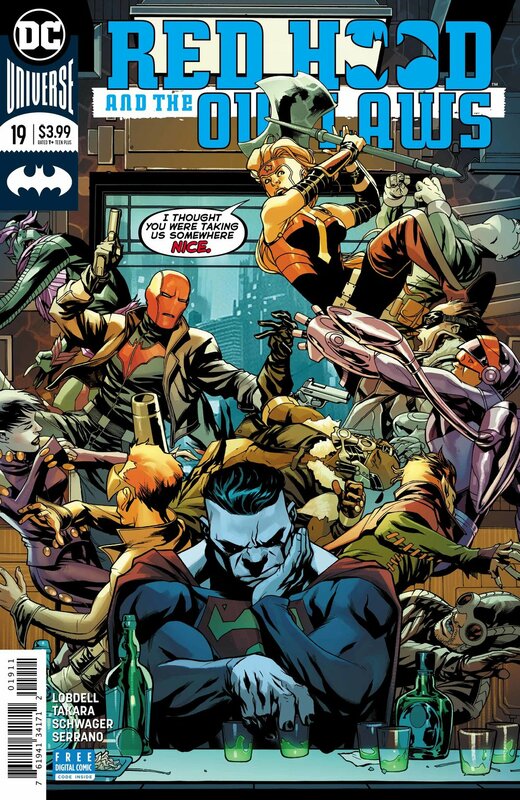 In Red Hood and the Outlaws #19, Red Hood, Jason Todd, former Robin and Artemis, an Amazon warrior from Themyscria are getting ready to go on a date after Red Hood lost a bet. This ends up being a ploy for Artemis to get Red Hood alone to express her concerns about Bizarro, who in previous issues, has changed from his usual simple mindedness to highly intelligent, due to Luthor tampering. Meanwhile, Bizarro's intelligence is slowly dwindling and he struggles to keep his mind together with an, almost addiction-like, need for a medicine to keep him smart. As said before, not much is happening in this issue but what is interesting about it is the what it sets up going forward as well as develop Bizarro more, assuredly building towards a dramatic conclusion. Red Hood and Artemis's date showcases Lobdell's charismatic dialogue and the strong relationship between the two, toeing the line between possible romance and deep friendship. Bizarro's dilemma is borderline gothic with the "monster" struggling to hold on to his obtained humanity and doing anything he can to maintain it. Art is pencilled by Marcio Takara, and colored by both Rob Schwager and Felix Serrano. The issue is set in the nightlife of Gotham City and they do a good job giving off that Friday night out vibe with black/blue skies and warm street lamps to light the way. Lightening has always been unique quality in Takara's work as he's able to bring out the shine of his settings.